Buffy The Vampire Slayer’s Rupert Giles has had one hell of a life. He was a bad boy that went by the name of “Ripper” in his 20s, and later in his adulthood, he helped save the world on multiple occasions as the mentor of Buffy Summers. Then he died, but death isn’t permanent in the Buffyverse. He was resurrected by his friends, and instead of returning to his old self, he was stuck in his pre-pubescent body with his middle-aged mind. Now Giles is a teenager, and it’s time for him to do what teens do: go to high school. 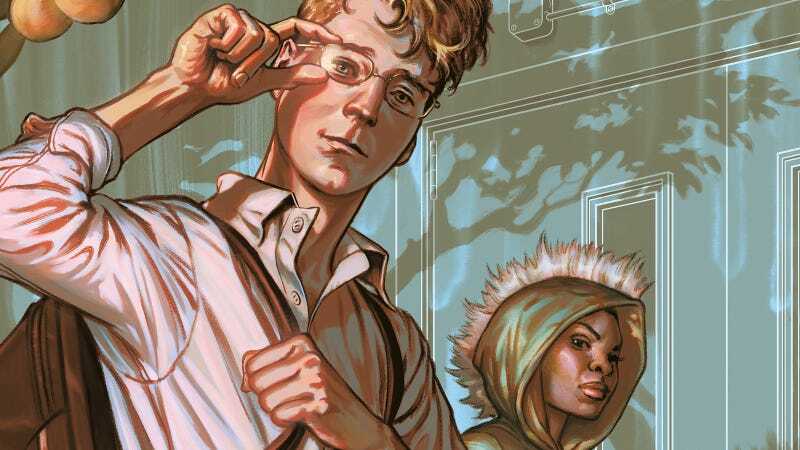 Buffy The Vampire Slayer: Giles is a four-issue miniseries debuting on February 28 that enrolls Giles in an inner-city public school to investigate the mysterious disappearance of teachers, and Buffy creator Joss Whedon is teaming up with writer Erika Alexander, artist Jon Lam, and colorist Dan Jackson to explore this new phase in Giles’ life. Whedon and Alexander’s story comes to life courtesy of artist Jon Lam, who showed a skill for drawing lively, fantastic school settings with his striking issue of Gotham Academy: Second Semester last year. “I feel that the tones for Gotham Academy and Giles have some similarities in that they involve supernatural elements centered around young adults, learning or relearning who they are as people and how they will face new incoming challenges,” says Lam. “That being said, I feel that in Gotham Academy, since there were uniforms, a lot of the character’s costumes were very similar, and in Giles everyone goes to a public school, so the outfits are a lot more personalized, which also adds another layer of challenge in design.